The adventures of Iboy and Teddy is getting more interesting. Now, they face a new enemy, a mysterious man who turns out to be the owner of the magic marble which is now belongs to Teddy. This mysterious man orders the black fairy to take the magic marble from Teddy. The fairy is in a dilemma because she’s been changed to a good fairy. She ask for a month to do that and extend time so that Teddy can continue living with the marble. Meanwhile, Ikhsan and Edo aware of Teddy and his powers. They use his powers to become great magicians. They live a luxurious life and become successful with Teddy's help. In human world, the mysterious man disguises himself as Alvin, the owner of an entertainment company. He realizes that there is something special about Ikhsan and Edo. He urges Ikhsan to tell him their secret. He is even willing to pay Ikhsan if he tells him his secret. But he fails because the black fairy already stops him. With her powers she makes them forget that they were famous magicians. Alvin is very upset but he doesn't give up. He continues to chase Teddy to get the magic marble. The black fairy and Airi try to collect more magic marbles and suddenly they meet a talking rabbit who accidentally swallowed one of magic marble. This talking rabbit creates animals such as a snake, bird, frog and panda to be a part of his team. With his new friends, the magical rabbit often fights with Iboy, Teddy, Airi and the black fairy. After the battles, Iboy manages to remove the marble from the rabbit's body. The rabbit now becomes just an ordinary rabbit. However the other animals can’t accept this and they want to take revenge. At the other side, Alvin finally forms his own army and calls them Tata, Titi and Tutu. The three of them help Alvin in all his plans and the animals also join with Alvin. The magic marble can transform into a bangle with super powers which can only be used by Iboy. This bangle can adjust to any situation and helps him to become a strong opponent for the mysterious man. Iboy, Teddy, Airi and the black fairy try to find out the whereabouts of this mysterious man. To prevent Ikhsan and Edo from worrying since Iboy gone, the black fairy creates a replica of Iboy. But then this replica makes Iboy have a bad incident and even used by Alvin to fight Iboy, Teddy, Airi and the black fairy. What will happen next? Do Iboy, Airi and the black fairy manage to defeat the mysterious man and his army? 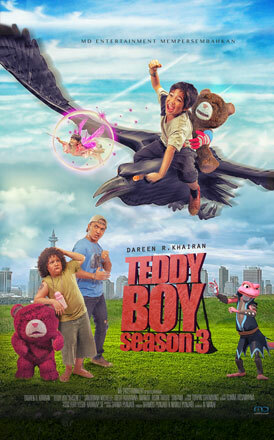 Follow this story in TEDDY BOY season 3!! !